One of the two Dallas police officers shot at a Home Depot in North Dallas on Tuesday has died. Dallas Police Chief Renee Hall said Wednesday morning that officer Rogelio Santander, 27, died of his injuries at Texas Health Presbyterian Dallas hospital at 8:11 a.m. Wednesday morning, The Star Telegram reports. "Fellow officer Chrystal Almeida and Home Depot loss prevention officer Scott Painter are still in critical condition, she said," writes the Telegram. "Santander is the first Dallas officer to die in the line of duty since five officers were killed in an ambush in downtown Dallas on July 7, 2016." Hall said that while Almeida and Painter remain in critical condition, they "are making remarkable progress." The shooting suspect, Armando Juarez, 29, was arrested on Tuesday after a five-hour manhunt that involved a high-speed chase through downtown Dallas. He faces multiple counts of aggravated assault on a police officer and was wanted on two previous felony theft warrants. A woman who was in Juarez's pickup truck was also arrested. A manhunt is underway after two Dallas police officers and a civilian were shot near a Home Depot in Lake Highlands on Tuesday. “The officers were critically wounded in the shooting about 4:15 p.m. in the 11600 block of Forest Central Drive, near U.S. Highway 75 and Forest Lane, police said. The civilian's condition was not available,” reports Dallas News. Witnesses say the suspect was wearing a white shirt and shorts. 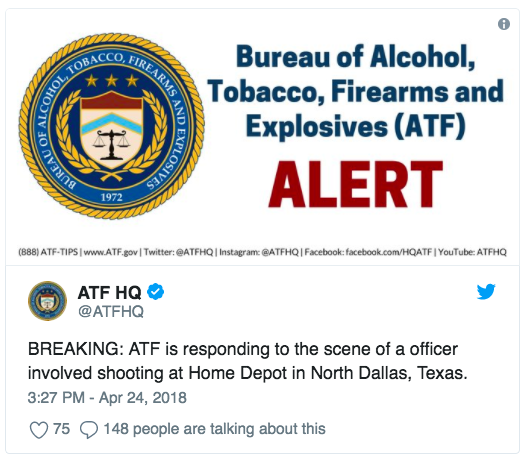 The Bureau of Alcohol, Tobacco, Firearms and Explosives (ATF) are also on the scene. Dallas PD confirmed on Twitter that both officers were “critically wounded” and wrote that the department “will provide updates as we get them. “Texas honors all the men and women who protect and serve our communities, and justice will be served,” he wrote. This story is developing. Stay tuned for updates.